“The disease comes to Manchester,” was how Marca, the Spanish sports newspaper, reacted to the news of Jose Mourinho's appointment as Manchester United manager in May 2016. Anyone who questioned that at the time will better understand now what they meant after observing Mourinho's caustic, corrosive regime at Old Trafford over the past 2½ years. His successor, interim or otherwise, was always going to benefit by virtue of simply not being Mourinho but, even then, it still requires some mental adjustment to listen to Ole Gunnar Solskjaer rejecting the bile that spilled freely from the Portuguese's lips in favour of an upbeat message that chimes with the club's long-held attitude and ambitions. In fairness, it was not just Mourinho who told United fans they would be wise to lower their expectations. 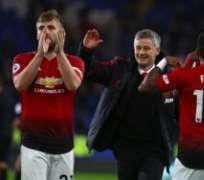 Louis van Gaal and David Moyes, his predecessors, did the same but Solskjaer scoffed at any notion of such a thing as he looked ahead to his first home game in charge, against Huddersfield Town on Boxing Day, following Saturday's thrilling introduction in the 5-1 thumping of Cardiff City. Cardiff provided a springboard and showcased a bunch of players revelling in new found liberation, and sticking two fingers up to Mourinho, but the idea that it will keep coming that easily to a team that had, over five-and-a-half seasons, become slaves to leaden, risk-averse football is probably a touch optimistic. They will have to be reprogrammed, in effect, but it will help no end that the players will embrace that process of change and that the natural inclinations of most are to attack. If United were in front under Mourinho, his default setting would be to defend what they had. He was all about the result and when those stopped coming there was nothing left but complaints, criticism and conspiracy theories. The message from Solskjaer could not be more different and it has invigorated a squad who were rotting with the handbrake on and shrinking in the face of frequent public attacks. “They've not said anything about any handbrake but we spoke in the team meeting about how when we get one, we want to get two and when we get two, we want to get three,” Solskjaer said. “That's the nature of this team, this club. You always go and attack. United have had such a hard time of it at Old Trafford this season that Mourinho was even asked recently if he would prefer to play away but the famous old ground should be a far more buoyant place to be this afternoon. The 20LEGEND banner in honour of Solskjaer, scorer of that dramatic 93rd-minute winner against Bayern Munich in the 1999 Champions League final, has been restored and the man himself is just itching to make that long walk from the tunnel to the dugout. “Of course I have my history at the club and to see that banner is special,” he said. “I just hope that, in the next five months, I'll do a good enough job for them to keep singing my name. For months, though, they have not. United have won just five of their 12 home matches this season and conceded 14 goals there. After Huddersfield, who have lost their past five games, United face Bournemouth on Sunday and Solskjaer does not want his players to feel inhibited or intimidated. The one voice Solskjaer plans to pay real attention to, though, is Ferguson, whose influence behind the scenes should not be underestimated.